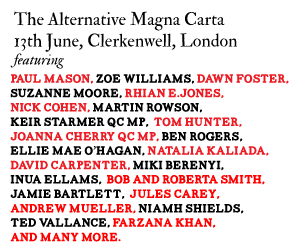 On 13 June, it’s the Alternative Magna Carta festival in Clerkenwell, London. Paul Mason, Zoe Williams, Nick Cohen, Suzanne Moore, David Flusfeder, Naomi Alderman, Ted Vallance, Tom Holland and many others – all for just a fiver! It will be a major festival to commemorate the 800th anniversary of the Magna Carta with some of the biggest names in economics, literature, journalism, politics and art, will come together in Clerkenwell for a day of debate, discussion, film, music, literature, debate, speeches, poetry and polemic. Hosted by Free Word with events from 89up, Little Atoms and friends for what promises to be the most vibrant political and literary festival this summer. Tickets just £5 – a limited number available here. 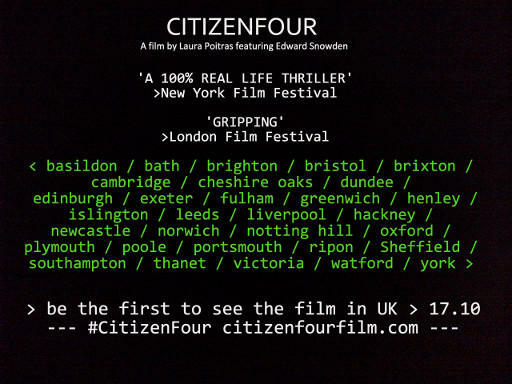 Be one of the first people to see CITIZENFOUR on the night of its European premiere – click here to buy tickets at one of the 70 cinemas showing the film across the UK. One year on since whistleblower Edward Snowden revealed the scale of the NSA and GCHQ’s mass surveillance, the Don’t Spy On Us campaign will host the biggest event on privacy in the UK this year. Speakers include: Cory Doctorow, Helena Kennedy, Jimmy Wales, Alan Rusbridger, Shami Chakrabarti, Bruce Schneier, Tim Duffy and Stephen Fry. Whatever you do, whatever your skills, join us on 7 June to take a stand for real surveillance reform. Tickets cost just £5 (£3 early bird discount) but are strictly limited and we expect a lot of interest so please do book as soon as possible. At London Book Fair, I’ll be interviewing Luke Harding on his new book, The Snowden Files: The Inside Story of the World’s Most Wanted Man. Luke Harding is an award-winning foreign correspondent with the Guardian. He has reported from Delhi, Berlin and Moscow and has also covered wars in Afghanistan and Iraq. He is the author of Mafia State and co-author of WikiLeaks: Inside Julian Assange’s War on Secrecy (2011) and The Liar: The Fall of Jonathan Aitken (1997), nominated for the Orwell Prize. It was British ingenuity that led to the development of the World Wide Wide 25 years ago today, and unfortunately it appears British guile will be responsible for its possible demise. The hopeful beginnings of the Web have turned sour. Our experience of free encylopedias, free global communications, free content, free universities, a knowledge explosion – is tempered by the knowledge that governments including our own are hoovering up our most personal data. Every day GCHQ has the capacity to process 21 petabytes of data a day, that’s 39 billion pieces of information. The state can pry into our video calls with our family; feels free to collect metadata that tells us if we’re visiting a cancer clinic (and to see whom), if we frequent gay clubs, or who our friends or associates are. The openness of the Web, where we share information to better humanity, is under seige. If we don’t act, the Web we have come to trust, will become ever more sinister. 25 years ago today, Tim Berners-Lee drafted a not immodest proposal for hyperlinked content that would become the Web. Written in biro, on his draft, a superior had noted ‘Vague but exciting’. Berners-Lee’s insight would revolutionise the way we shop, the way we interact and the way we think about information. In part, the genius of the Web was to see the links between different pieces of content and make it easy to distribute. 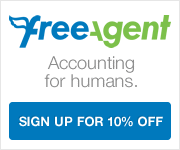 Another often overlooked reason why the Web succeeded is that it is based on open standards that were free for everyone to use. Anyone can produce a website and no one has to pay Tim Berners-Lee a penny. This gift to the world faciliated an information revolution that has made it harder for the media moguls but given us mere mortals a real chance to learn as much as our brains can store. Simultaneously, as the Web became a greater part of our lives, connection speeds rose exponentially (I find it hard to explain just how slow a 14.4k modem is to anyone under 20), and so did the amount of data it was possible to transmit. It also made us liable to spill our private data across the Web. This, we have now learnt thanks to Edward Snowden, was an open invitation to GCHQ. How is that spirit of openness possible in a world where we say the state can invade the privacy of everyone – regardless of their innocence or guilt? The founders of the Web are also concerned over another possibility: that the open Web they have created will be eroded as more and more people go offline to protect their privacy. Increasing numbers of activists are using high-tech tools such as TOR or TAILS to encrpyt their internet browsing and email (there was a huge Cryptoparty in London organised by English PEN and Open Rights Group just a few weeks ago). If the state continues to invade our privacy, it is a real possibility that the Web could fragment into a series of highly encrpyted parallel networks. Or, as we see from sabre-rattling from Brazil, nations could “force data to come home”, meaning the global Web as we know it could be replaced by national Web(s). That’s why we’re about to launch the Don’t Spy On Us campaign, a coalition of the leading human rights, privacy and freedom of expression organisations. You can sign up to the campaign here. In the spirit of the Web’s birthday, we’re calling for real openness about the scale of surveillance and the reforms to the law required to put surveillance on a clear legal footing. We want a proper independent inquiry, to report before the next general election. Then we want to see our MPs commit to reform. It’s time British politicians acted to get GCHQ under control. It’s taken 25 years to get the Web we want, it may not take much time at all to wreck it. Very few know why the Defamation Bill does not apply to Northern Ireland, an outrageous decision that has created a gaping loophole in the government’s attempts to reform the UK’s libel laws. It took endless humiliation before parliament got the message and decided to reform the law of libel: the UN Human Rights Council said our libel law chilled free speech across the entire globe, American academics faced our courts for writing about the funding of Al Qaeda, Barack Obama signed into law an Act to protect Americans from our libel law and decent scientists such as Simon Singh, Ben Goldacre and NHS cardiologist Pete Wilsmhurst faced ruin thanks to the law. These humilations led the three major political parties to make a commitment to libel reform in their general election manifestos in 2010. They didn’t qualify this bold commitment with “except in Northern Ireland”. Why would they? The law in Northern Ireland has always been substantially the same as the law in England and Wales, that is until the government reformed it. At no point in the parliamentary debate did the government signal the Defamation Bill would not apply to the citizens of Northern Ireland. But that’s what happened. In the name of devolution, a DUP Minister was able to block (single-handedly) the law from applying to the province. The law was blocked in a less than democratic manner that is still clouded in secrecy. The former Minister of Finance and Personnel, the combustible Sammy Wilson MLA, withdrew a paper on adoption of the new Defamation Bill without scrutiny by either the Assembly or the Executive. Wilson’s Department refuses to comment, even to a political committee in Stormont, on why consents for the Defamation Bill weren’t sought in the required timescale. What is known is that just days after the DUP’s Ian Paisley Jnr MP made no less than 10 interventions casting doubt on the Defamation Bill in its second reading debate in the House of Commons, Wilson withdrew the paper relating to adoption of the Defamation Act. “The volume of solicitors’ letters from DUP to BBC over one Spotlight episode gives a pretty clear hint as to why DUP blocked libel reform”. The DUP have been very clear in stating their opposition to reform. Worse still, due to the cross-community provisions in the Good Friday Agreement, as the largest Unionist party the DUP can effectively block any Bill they don’t like – even though they only control 38 of the Assembly’s 108 seats. With a majority in the Assembly sympathetic towards the prospect of libel reform and a consultation showing 90% of people in Northern Ireland back reform of the law, this is hardly democratic. A Private Member’s Bill launched by Mike Nesbitt, the leader of the UUP, attracted support in the Assembly. But now it has been put on ice after the new DUP Finance Minister set the Northern Ireland Law Commission off to run a consultation on the law of libel. While the Law Commission is an esteemed institution, many politicians feel this is an attempt to kick the matter into the long grass. No date has been set for the Commission to launch their consultation, it may not happen for a year. Worse still, evidence submitted to the Law Commission will not be protected by privilege, leaving NGOs reporting on the libel threats dished out by politicians themselves open to libel actions. Next week in Parliament, an attempt will be made by Peers to amend the Northern Ireland (Miscellaneous Provisions) Bill to extent the Defamation Act to Northern Ireland. Seeing the impact on freedom of expression and the opaque manner in which this issue has been handled, respected parliamentarians are backing the amendment. It is a direct challenge to the DUP who felt they alone could decide on libel reform. The question now is whether the Labour party and Liberal Democrats will back this amendment. Both parties, in particular Labour as the midwife of the Good Friday Agreement, feel fealty towards devolution. Yet, they did also tell the UK at the last election if elected they would reform the law of libel – with no exception. Parliament should send a clear message to the DUP – you alone cannot decide on whether free speech is good enough for the citizens of Northern Ireland. Next year, it’s the 800th anniversary of the signing of the original version of Magna Carta. The anniversary seems an appropriate time to reassess the state of civil liberties in the United Kingdom. What would Magna Carta+800 look like? In the coming months, I’ll be canvassing views on what a modern Magna Carta would look like. I’d like a UK First Amendment that provides the level of protection for freedom of expression seen in the United States. Arguably, this would not be compatible with the European Convention on Human Rights. Yet, a British Bill of Rights (and dare I say it, a British Constitution) could be an ideal outcome in a United Kingdom that has seen off Scottish independence and is celebrating 800 years of one of the most important documents in human history. With the UK reassessing its relationship with Europe, rethinking its national identity and grappling with huge challenges to civil liberties (from TEMPORA surveillance to secret courts), this debate cannot come soon enough. Jobbik are a vile political party. The far-right political movement holds 3/22 Hungarian seats in the European Parliament and 47 seats in the Hungarian Parliament. As noted by Progress it is anti-semitic, anti-Roma and homophobic and allies with other European far-right movements including the British National party, Front National and Golden Dawn. Jobbik is part of Hungary’s new right-wing politics that has seen its Prime Minister Viktor Orbán clamp down on press freedom and rewrite the country’s constitution. This weekend, the leader of Jobbik, Vona Gobor will attempt to rally his Hungarian supporters living in London. A number of Labour politicians including Camden’s Labour councillors and London Assembly Member Andrew Dismore have called for Gabor to be banned from entering the UK. They are wrong to do so. Jobbik, like the BNP, is a legal political party. There is a significant difference between opposing fascist political parties which the excellent Hope Not Hate does, and banning political opinions (however offensive and vile) that you do not agree with. Dealing with hate speech is of course complex. But the attempt to bar political opinions you don’t like (the “no platform” policy of various student unions for instance) or prosecute them out of existence, has limited impact. Offensive opinions will regroup in the dark recesses of the internet. In contrast, winning the argument and exposing the far-right works. As UN special rapporteur on freedom of expression Frank La Rue has pointed out in a recent report on hate speech the best way to combat hate speech is through more freedom of expression not less. The BNP is in considerable retreat because it has been given a platform, exposed and ridiculed. Subjecting the BNP’s claims to scrutiny and giving a voice to those who are victims of hate speech has neutered it. Banning the BNP would have, in hindsight, been counter-productive. The same is true of Jobbik. Let Gobor speak to a tiny hate-filled audience. Go and protest outside. Expose the anti-Semitic and hatred. A Home Office ban would give Gobor the opportunity to tell an old lie from history – that the far-right are persecuted because only they speak the truth and the “liberal elite” are too frightened to let people to hear their message. It’s these conspiracies that fan the flames of racism. It would also impact negatively on the situation in Hungary where free speech is in decline. Jobbik’s racism is increasingly becoming protected speech by Orban’s right-wing government. As Index on Censorship points out, the Hungarian Ambassador to Austria called for the cancellation of an anti-Jobbik art exhibition which opened in the Austrian city of Linz in October last year. The exhibition by Roma artist Marika Schmiedt drew parallels between the Nazis and the Jobbik party. One poster shows Hungarian Prime Minister Viktor Orbán on the label of “Natural Smoked Gypsy Cooked Salami” – right next to a Jobbik logo. The Ambassador, Vince Szalay-Bobrovniczky described the exhibition as “a cheap provocation, openly racist and hostile against Hungary”. Unless we remain respectful of the right to free speech of vile anti-Semites such as Gobor, we risk strengthening the hand of the already powerful against marginalised voices such as Roma artists and Hungary’s under siege media. You can donate to Hope Not Hate here. On 1 January 2014, the Defamation Act took effect across England and Wales. The Act will have a hugely positive effect on freedom of speech and better protect the public interest, fair comment and individuals from corporate bullying. But – who made this happen? This is my personal take on the individuals who are the heroes behind the Libel Reform Campaign. My list can’t (and doesn’t) cover the 60,000 people who took the time to sign the petition, lobby their MPs and write to every newspaper in the country. Nor can it anything but touch upon the donors, 100 affiliated organisations or politicians who made the campaign a huge success. I will have no doubt forgotten hugely significant people from the list – omissions are entirely the fault of my lacklustre memory. Simon was the inspiration for and constant source of energy for the campaign. Simon’s absolute stubborn determination to do something about the state of the law during and after his case was extraordinary. A true modern hero. Dr Wilmshurst risked his family home and his professional career to speak out about a study into a medical device. Alike many of the victims of libel who joined our campaign, Dr Wilmshurst dedicated a huge amount of personal time in order to speak to politicians to persuade them to get the law right. Don’t talk to Dr Goldacre about vitamin pills. His case illustrated the dangers of the state of the libel law – and his unwavering support broadened the campaign considerably. Honorable mentions: CarersWatch, Alex Hilton, John Gray, Vaughan Jones, Stuart Jones, Lesley Kemp, David Osler, Hardeep Singh. Lots of famous people turn up to an event, have their photo taken and disappear. Not these lot. 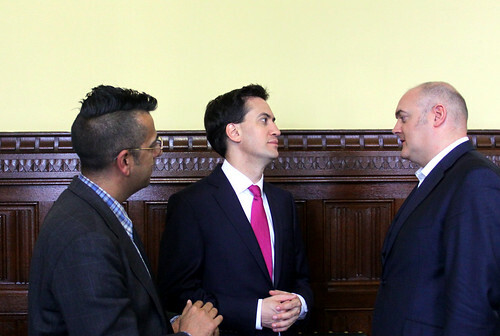 My favourite Dara moment isn’t the Big Libel Gig where he gave a barnstorming performance, but him in private meetings with Ed Miliband and Lord McNally where his knowledge of the law was not only impressive, but mildly terrifying to the politicians who expected mild-mannered banter but were put on the spot. Not only did Prof. Cox find the time to tour TV studios, but he handed in our 60,000 strong petition to Downing Street and used his Sun column to back the campaign. One of the key figures behind the Mass Rally for Libel Reform an event the then Justice Secretary Jack Straw described as the best attended he’d seen in parliament in years. The brilliant host (and co-organiser) of the Big Libel Gig, Robin rounded up as many of his contacts as he could to put on the greatest comedic show ever – about the law of defamation. Honorable mentions: Marcus Brigstocke, Stephen Fry, AC Grayling, Ian Hislop, Shappi Khorsandi, Tim Minchin, Jonathan Ross, Adam Rutherford. Lisa’s personal experience of the libel laws as a writer made her push for libel law reform as early as 2008 while PEN President. From the Ehrenfeld case through to Singh case and Lord Puttnam’s last minute attempt to tack Leveson into libel (and wreck the Bill), Cohen has written more than almost anyone else on why libel reform was necessary and just. David’s call to arms in the Wetherspoons pub (the Penderal’s Oak) in Holborn is immortalised in a plaque that now hangs on the wall. As one of the campaigning lawyers and journalists who gave impetus to the campaign he stuck with us through thick and thin. Had to wade through as many op/eds on libel reform as any sane person could handle. But continued to give unstinting support to the campaign. Honorable mentions: Jake Arnott, Guy Black, Phillip Campbell, Amanda Craig, Frances Gibb, Fiona Godley, Afua Hirsch, Natasha Loder, John Micklethwait, Alan Rusbridger, Nick Ross, John Sweeney, Craig Woodhouse, Peter Wright. Simon Singh’s lawyer first and foremost but also the defender of a long list of other worthy folk. Dougans is a one-man free speech engine. Defended the Owlstalk bloggers and Dr Peter Wilmshurst from libel actions. An endless source of knowledge, time and ideas for the campaign. Gave the campaign exceptionally useful advice during the passage of the Defamation Bill especially on how to improve the public interest defence. Endless good advice and practical examples of how the law chilled responsible journalism. An enormous help to the campaign in refining our position on costs, the public interest defence and in a number of other key areas. Chair of the Alternative Libel Project. His sensible stewardship has made cheap alternatives to a full trial possible. Gave a significant amount of his time to the original report and subsequently to promoting libel reform within the legal profession. Honorable mentions: Alistair Brett, Joanne Cash, Harvey Kass, Caroline Kelly, David Marshall, Gavin Millar, Brian Neill, Marcus Partington, Jonathan Price, Heather Rogers, Pia Sarma. People who gave their time. For free. The nerds (as a compliment) who launched Geek Calendar not only made the must-have calender of 2011, but raised thousands of £s for the campaign. Special thanks to the organisers Mun-Keat Looi (@ayasawada); Alice Bell, Louise Crane and the production team Ben Gilbert, Greg Funnell; Cosima Dinkel; Greg Foot, Barry Gibb, Tom Ziessen. The co-organiser (and inspiration for) the Big Libel Gig, a huge sell out show in front of over 2,000 people in London’s Palace Theatre. Tracy’s gig was a massive success that fired a rocket up the politicians. Mumsnet’s Justine Roberts donated a staggering £12,500 to the Libel Reform Campaign and kept her organisation behind the campaign through the whole 4 year period. Global Witness’s evidence to parliamentarians made a huge difference in persuading the government to update and improve the public interest defence. Honorable mentions: Emma Ascroft (Yahoo! ), Kate Briscoe, David Colquhoun, Richard Dunstan (Citizens Advice), Francisco Lacerda, Antony Lempert (British Medical Association), Richard Mollet (Publishers Association) Dalia Neild, Bob Satchwell (Society of Editors). You only ever hear bad stuff about politicians. This group of politicians put party-politics aside and made a big difference. The “grandfather” (in his own words) of the Defamation Act. Without Lord Lester’s private members bill, none of this may have been possible. His private bill showed that placing important defences into statute was feasible and created a vehicle for the final Act of Parliament. I may have an absolutely fundamental disagreement with Evan over Leveson, but frankly without his tireless commitment to the campaign and sage advice the campaign would not have been such a success. A truly fearsome campaigner. Did what he said he would — as Justice Minister he delivered the first wholesale reform of the law since 1843. Labour’s shadow Justice Secretary really kept the pressure on the government to improve the Defamation Bill throughout the parliamentary process. Sadiq scored a big victory in reducing the ease with which corporations can sue for libel. Paul founded the All Party Parliamentary Group on Libel Reform which helped coordinate sympathetic MPs to push for libel reform. As Chair of the Joint Scrutiny Committee of the draft Defamation Bill, he oversaw a scrutiny process that enhanced and strengthened the Defamation Bill (rather than, as we feared, may have weakened it). His Committee’s important report (Culture, Media and Sport Select Committee) into libel significantly increased the momentum in parliament for reform. Honorable mentions: Lord Allan, Baroness Bakewell, Lord Bew, Peter Bottomley MP, Lord Browne, Viscount Colville, David Davis MP, Paul Farrelly MP, Rob Flello MP, Lord Grade, Dominic Grieve, Baroness Hayter, Julian Huppert MP, Lord Macdonald, Baroness O’Neill, Jack Straw MP, Lord Taverne, Lord Willis of Knaresborough, every MP who signed EDM 1636 and EDM 423. Tracey Brown, Jo Glanville, Jonathan Heawood (@jheawood), John Kampfner (@jkampfner), err me Mike Harris (@mjrharris), Síle Lane and Robert Sharp (@RobertSharp59). Honorable mentions: Chris Peters, Padraig Reidy. Just a note of caution. The Report recites in non-technical language the general criticisms of the present law, and lists them as complication, cost, uncertainty, stifling of public discussion, undue severity upon unintentional defamation and bias in favour of ” gold-digging ” plaintiffs. That report was not Free Speech Is Not For Sale but the Porter Report of 1948 which recommended reform to the law of libel which culminated in the Defamation Act 1952. Sixty years on, after initial progress, reform was required once more. The Report abhors what it calls “Group Defamation,” for example, the vilification of a particular race or creed or party, but considers that any attempt to go beyond the present law as to seditious libel would curtail free political discussion. Why is the EU not Protecting Media Plurality? Media plurality is just one of the issues raised in my recent report into the European Union’s record on freedom of expression, Time to Step Up: The EU and freedom of expression. This blog was originally posted on the LSE Media Policy Project blog.